In the basement of MIT's Building 3, a robot is carefully contemplating its next move. It gently pokes at a tower of blocks, looking for the best block to extract without toppling the tower, in a solitary, slow-moving, yet surprisingly agile game of Jenga. As the robot carefully pushes against a block, a computer takes in visual and tactile feedback from its camera and cuff, and compares these measurements to moves that the robot previously made. It also considers the outcomes of those moves—specifically, whether a block, in a certain configuration and pushed with a certain amount of force, was successfully extracted or not. In real-time, the robot then "learns" whether to keep pushing or move to a new block, in order to keep the tower from falling. "Unlike in more purely cognitive tasks or games such as chess or Go, playing the game of Jenga also requires mastery of physical skills such as probing, pushing, pulling, placing, and aligning pieces. It requires interactive perception and manipulation, where you have to go and touch the tower to learn how and when to move blocks," Rodriguez says. "This is very difficult to simulate, so the robot has to learn in the real world, by interacting with the real Jenga tower. The key challenge is to learn from a relatively small number of experiments by exploiting common sense about objects and physics." "In a cellphone assembly line, in almost every single step, the feeling of a snap-fit, or a threaded screw, is coming from force and touch rather than vision," Rodriguez says. "Learning models for those actions is prime real-estate for this kind of technology." The paper's lead author is MIT graduate student Nima Fazeli. The team also includes Miquel Oller, Jiajun Wu, Zheng Wu, and Joshua Tenenbaum, professor of brain and cognitive sciences at MIT. In the game of Jenga—Swahili for "build"—54 rectangular blocks are stacked in 18 layers of three blocks each, with the blocks in each layer oriented perpendicular to the blocks below. The aim of the game is to carefully extract a block and place it at the top of the tower, thus building a new level, without toppling the entire structure. To program a robot to play Jenga, traditional machine-learning schemes might require capturing everything that could possibly happen between a block, the robot, and the tower—an expensive computational task requiring data from thousands if not tens of thousands of block-extraction attempts. 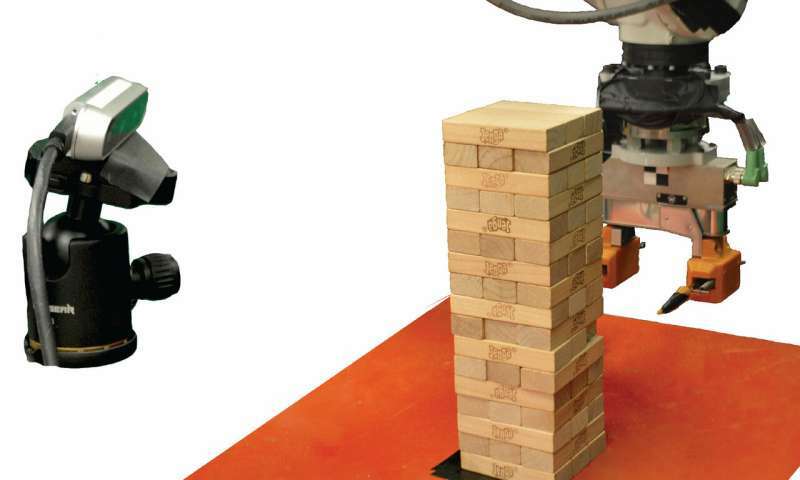 The team customized an industry-standard ABB IRB 120 robotic arm, then set up a Jenga tower within the robot's reach, and began a training period in which the robot first chose a random block and a location on the block against which to push. It then exerted a small amount of force in an attempt to push the block out of the tower. Rather than carry out tens of thousands of such attempts (which would involve reconstructing the tower almost as many times), the robot trained on just about 300, with attempts of similar measurements and outcomes grouped in clusters representing certain block behaviors. For instance, one cluster of might represent attempts on a block that was hard to move, versus one that was easier to move, or that toppled the tower when moved. For each data cluster, the robot developed a simple model to predict a block's behavior given its current visual and tactile measurements. Fazeli says this clustering technique dramatically increases the efficiency with which the robot can learn to play the game, and is inspired by the natural way in which humans cluster similar behavior: "The robot builds clusters and then learns models for each of these clusters, instead of learning a model that captures absolutely everything that could happen." 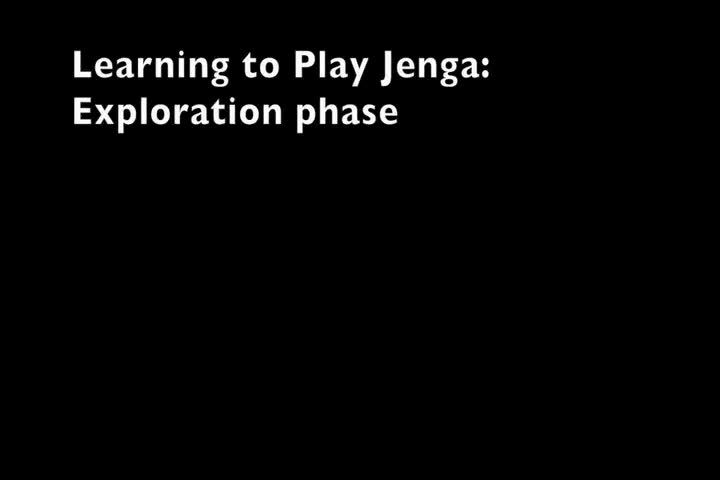 "We provide to these algorithms the same information our system gets, to see how they learn to play Jenga at a similar level," Oller says. "Compared with our approach, these algorithms need to explore orders of magnitude more towers to learn the game." "We saw how many blocks a human was able to extract before the tower fell, and the difference was not that much," Oller says. "There are many tasks that we do with our hands where the feeling of doing it 'the right way' comes in the language of forces and tactile cues," Rodriguez says. "For tasks like these, a similar approach to ours could figure it out."